Includes Monopolar Footswitch, Bipolar Footswitch, and cart (optional). Available with password or with keys. Complete all cables , printer and cart. The durable Stryker Stretcher Chair performs multiple functions while enhancing stability, comfort, mobility and safety. Includes a used mattress (Color:Blue) in very good condition, and a foot rest cushion. 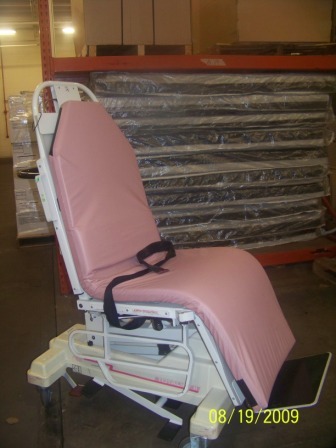 This stretcher / chair also carries other features such as I.V. Pole, UP/DOWN, Hands-free Trendelenburg, swing down side rails with comfort armrest, and more. This unit is in very good working and cosmetic conditions. Magnifications 5-10-20x. Teaching / Assistant Lense. Excellent Condition. Brand New Bulb. * ATL C4-2 Curved Array multifrequency 4.0-2.0 MHz. All description is as shown at the pictures. 2 hoses Gas hose from source and hose to hand pices. Constant & Intermittent Pump with timer. Gomco model 6033 same as model 6037. For All Routine Suction Procedures. STERILIZER, SURGICAL INSTRUMENT AND DRESSING, PRESSURE, STEAM, ELECTRIC, OR GASOLINE BURNER (NOT INCLUDED), CORROSION , RESISTANT METAL, 16x36, 208-220-380-440 VOLT, 50/60 CYCLE, AC.